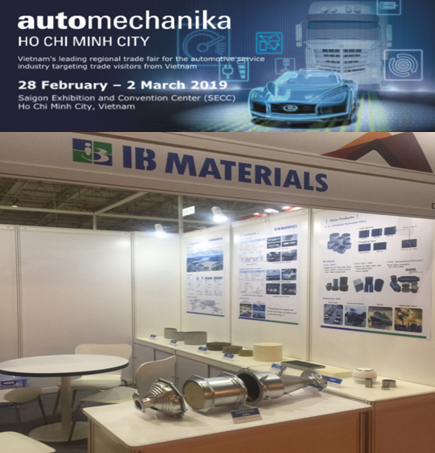 IB MATERIALS participated in Automechanika Ho Chi Minh City 2019 from February 28 to March 2 in Ho Chi Minh City, Vietnam. Automechanika is one of the biggest automotive parts exhibition and taking place in Frankfurt, Germany and other countries around the world. According to the organizer, 380 exhibitors attended and around 8,600 buyers visited during the show. Due to getting worse air pollution, many buyers are interested in IB MATEIRALS product such as Air cleaner, DPF, DOC, CDPF, and SCR. IB MATERIAL attended this show to find out the potential and to establish a bridgehead for ASEAN market. Due to getting worse air pollution, many buyers were interested in not only emission parts for vehicle such as DPF, DOC, CDPF, and SCR but also appliance like air cleaner. Filter and catalyst products used to remove the particulate matter and harmful gasses emitted from the fossil fuel-fired internal combustion engines of vehicles or vessels. Filter and catalyst products used to remove pollutants emitted from power plants, incineration plants and other plants. Ceramic filters with fine pores provide water treatment techniques that can effectively remove contaminants from the water.